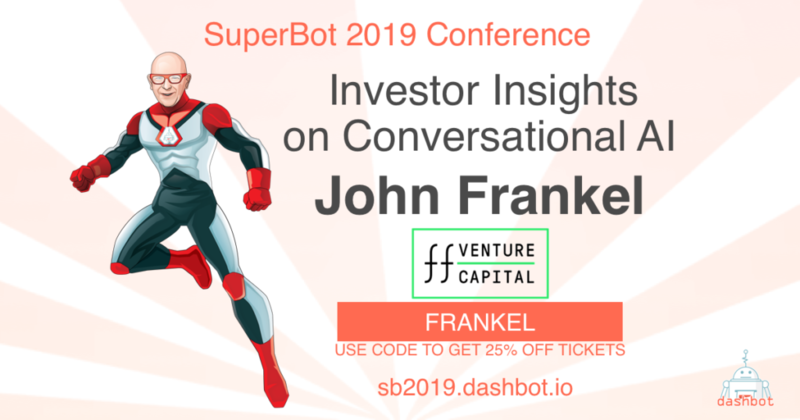 We’re thrilled to have John Frankel, founder of ff Venture Capital joining us at SuperBot 2019 to share his insights on investing in conversational AI and the larger tech space. John Frankel is a technology investor. He is passionate about working with founders that are building the big businesses of tomorrow. He founded ff Venture Capital in 2008 to work with founders who share this vision, which has since funded over 100 seed and early-stage companies that have in turn created thousands of jobs and impacted the lives of millions. While ff Venture Capital’s investments span a number of industries, John is particularly fascinated by applied artificial intelligence, encompassing drones, robotics, financial services technology and cyber security. Over the years, John has served on the boards of dozens of companies as well as the NYU Tandon School of Engineering, to help in further fostering the New York City ecosystem. Prior to founding ffVC, John had a long career at Goldman Sachs in a variety of roles that involved technology development, business reengineering, and capital markets. He has had the unique opportunity to work closely with some of the world’s leading investors, and as a result has developed a keen understanding of emerging technologies and portfolio risk/return management. After graduating from New College Oxford in 1982 with a Masters in Mathematics and Philosophy, John worked at Arthur Anderson and qualified as a Fellow Chartered Accountant. Today, John enjoys traveling the world and is blessed with five amazing children and three incredible grandchildren.